Two contractors have come forward with their own details surrounding Michael Brown’s fatal shooting in early August in Ferguson, Mo., corroborating other witness reports that insisted the teen had his hands up in surrender before he was killed by police Officer Darren Wilson, CNN reports. 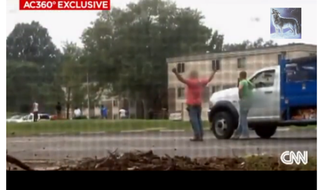 In exclusive video obtained by CNN, taken by an unknown cellphone videographer, the two contractors, who are not from Ferguson, can be seen shouting and gesturing in disbelief at what they saw unfold just moments before. “He had his f—kin’ hands up!” a contractor in a pink shirt shouts across the street from the incident. In the video the man can be seen gesturing with his hands up, as he described Brown doing before he was killed. The contractor told CNN that he heard one gunshot, followed by another some 30 seconds later. “The cop didn’t say get on the ground. He just kept shooting,” that contractor, who did not want to be identified, told CNN. He told the channel that he saw Brown’s “brains come out of his head” in the gruesome scene, reiterating that the teen had his hands up. The other contractor, pictured in the green shirt, who also wished to remain unidentified, backed up his partner’s story, telling the channel that he saw Brown running away from the police car. That contractor also insisted that Brown put his hands up in the air while Wilson chased him. The contractor in the green shirt said that Wilson also fired a shot while Brown’s back was still turned. Other witnesses to Brown’s shooting have said that the teen had his hands up and was trying to get away from the officer when he was gunned down.